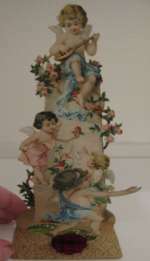 Antique Victorian 3-dimensional Valentine card, PoP-up Scrap. Golden harp w. flowers and birds. What a romantic Victorian Valentine card! 3-dimensional scrap. 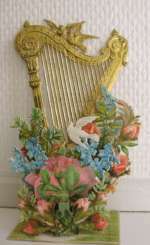 Golden harp w. Forget Me Not flowers, roses and birds. Wonderful condition This piece is 4 layers deep , a third row has a large oval wreath of roses and a dove and the very back is a large gazebo structure. Forget Me Not flowers h.17 cm A beautiful addition to a doll´s scene. 19th century. Antique Victorian scrap Valentine. Angels -3 dimensional. Paper/ cardboard. Card.